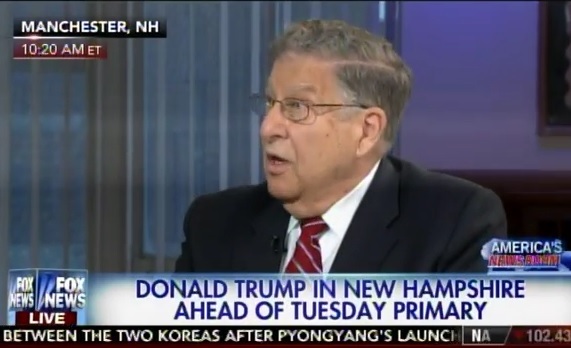 Sununu is not a Trump supporter. Either is former Senator Judd Gregg. Today the two establishment Republican (GOPe) leaders urged voters not to vote for Ted Cruz or Donald Trump. Two stalwart New Hampshire Republicans — Judd Gregg and John Sununu — say the party needs to coalesce around an alternative to anti-establishment insurgents Donald Trump and Ted Cruz — and fast. Arguing that either Trump and Cruz would be a general election disaster, Gregg and Sununu told a Bloomberg Politics breakfast that the winnowing starts with Tuesday’s primary in New Hampshire and should be pretty much done after the South Carolina primary on Feb. 20. “If four people come out of South Carolina, we’re headed into a brokered convention,” said Gregg, a former governor and senator from New Hampshire who backs Jeb Bush. The nomination of either would lead to a Republican defeat in the fall and loss of control in the U.S. Senate, they said. Gregg and Sununu said the candidates vying for the establishment vote right now are splitting the mainstream GOP voting bloc. The longer more Republicans stay in, Sununu said, the more likely “a convention that starts undecided” on the identity of the nominee.